As my networking background is traditionally based upon Cisco routing and switching, I thought it would be sensible to get some half-decent CLI time on JUNOS, as opposed to just reading books and PDFs etc. One such way of getting CLI time is to build an "Olive" box which effectively runs JUNOS software on a FreeBSD Unix-like free operating system. For details of what an Olive box is, please visit here. If you did not know, Olive requires managing through the serial port (e.g. COM1) of a PC, similar to a console port of a router. 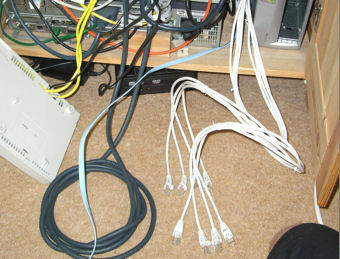 Only the earlier versions such as JUNOS 5 allow you to access the CLI through the PC keyboard and VGA output directly (although this view was still not identical to a serial connection). The recent versions of code after JUNOS 7.4 which stand any chance of detecting your NIC card, can only be accessed through the serial port. I customised a cable to allow me to do this below, but later use some clever free software to create multiple virtual serial ports which I can telnet in to, making physical cables unnecessary. This long page, only concentrates on running Olive in a VMWare virtual environment - I have no interest in building a real Olive by dedicating a whole PC to the task - not even using dual-boot. The primary reason for this is a single Olive is of little use to me - I aim to use a minimum of three so I can get to grips with the routing protocols and filtering techniques where a single Olive would be next to useless. Please do not contact me for any JUNOS images - I will not provide them. "Olive" is not supported by J-TAC and they should never be contacted about it. Throughout this document, I never pretend to be a Juniper, JUNOS, VMWare or FreeBSD expert. I know a little, and its good to share knowledge. I decided I wanted to run my Olive box in a VMWare virtual session/environment, as I use the box extensively for other functions and did not want to make the device dual boot. I appreciate this creates a performance trade-off but from an education, flexibility and learning point of view, VMWare is fantastic. My "cupboard server" (which I use for many things including a home web server running Apache, hosting tools to assist with my CCIE revision and running Dynamips/Dynagen) is a second-hand HP-Compaq Evo Small Form Factor (SFF) d530 P4 2.8Ghz, 1.5GB RAM and several hundred GB of disk space over two HDDs, running XP Pro SP2. 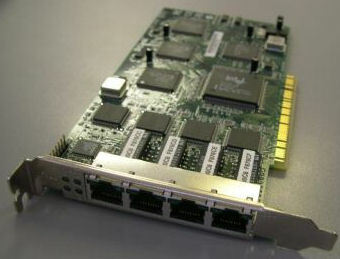 The box has 9 NICs - 1 on board which is a Broadcom NetXtreme GigE and 2 x PCI 4 port D-Link DFE-570TX NICs (see the card below - bought second-hand from Ebay which uses the DEC tulip (now Intel) 21143 chipset) - these NIC ports can either be "teamed" for load balancing/fault tolerance features, or as I do, use each NIC port as a seperate interface with its own MAC and IP address. I primarily need the 9 NICs to support a Dynamips configuration nearly identical to this for my CCIE revision. VMWare Server is running v1.03 (which I find much faster than MS Virtual PC), and as discussed above, towards the end of my installing Olive, I had to move to VMWare Workstation v6 as VMWare Server would not properly activate the JUNOS NICs (I still do not know why as FreeBSD which sits under JUNOS used the NICs perfectly under VMWare Server). For nearly all of my efforts getting JUNOS to work in VMWare, I did so using VMWare Server 1.03 (which is Free). I created the virtual machines, installed FreeBSD, installed JUNOS, added a second hard disk image to a <7.4 JUNOS setup so I could get a >7.4 JUNOS jinstall image on the box to allow the detection of my NIC cards, etc. In VMWare Server, JUNOS will run, and it will detect the NIC cards, BUT it will not USE the NIC cards - it absolutely refuses to do anything with them. As soon as you load the image created in VMWare Server into VMWare Workstation, without making any config changes, the NICs suddenly spring into life. I also tried running the self-same identical images on the free VMWare Player but they do not work. I guess what i'm trying to say is if you only have VMWare Server (even though you can get Workstation on a 30 day trial for free), then you will not be hindered until the very end of setting up one of these boxes - FreeBSD will still use the NICs perfectly, it's only JUNOS which appears to have a problem, but you can get all the way up to the final stage of having a working Olive box using VMWare Server (as this is how I did it). If in doubt, and you have Workstation, use it from the start. From a Google, it appears that v5.5 of Workstation will support the latest JUNOS, you do not necessarily need v6. When it came to using the Olive box however, VMWare Server was no longer useful and only VMWare Workstation was able to work with the virtual NICs. For info I used VMWare Workstation 6.0.0 build 45731. VMWare profile I used: 256MB RAM (I may lower this later once Olive is built); 1 x CDROM (linked to an ISO, not a physical drive); 3 x Ethernet NICs configured as 'bridged' (you would be fine with one NIC); 1 x serial port (output to a text file at first, as opposed to COM1 unless you have an appropriate serial cable); 8 GB hard disk (untick 'allocate all disk space now'); for Operating System profile choose 'Other' then 'FreeBSD'. 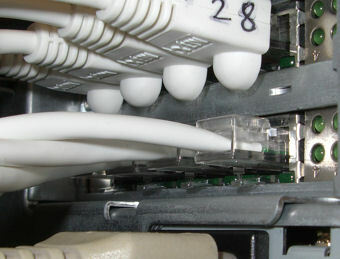 Once you run the machine, the .vmx file will allocate MAC addresses to the virtual interfaces - if you are running multiple machines, and want them to work together at some stage, you need to ensure all virtual NICs have unique MAC addresses (they only need to vary by one hexadecimal character). Once complete, to guarentee these changes are picked up, it may be best to right click on the machine, click "remove from inventory", then re-add it by file, open, browse and navigating to the directory containing the .vmx file you edited. I downlaoded FreeBSD 4.10-RELEASE-i386-miniinst.iso (~220MB) and when bound to a VMWare CDROM, this will boot. Start VMWare machine, and at the "Kernel Configuration Menu" choose the top option of "Skip kernel config<snip>"
At the "SysInstall Main Menu" choose "Express - Begin a quick installation (for the impatient)"
For the "Boot Manager" choose "Standard - Install a standard MBR (no boot manager)"
For "Choose installation media" choose "CD/DVD"
At the window where it gives you an opportunity to "Visit the general config menu for a chance to set any last options", choose "Yes"
A final confirmation will ask if you want to reboot, choose "Yes"
At this point, before I document the procedure, I guess I should explain some of my findings! When I installed an earlier version of JUNOS (version 5.7R2.4), I found that once rebooted, I could gain access to the JUNOS CLI without the need to use the serial port. The normal keyboard and VGA output allowed me to access the CLI. This version could not see my "e1000" network cards, but still it was nice to get my hands on the CLI for the first time, even though I had no interfaces. Suffice to say, I got bored quickly. To install JUNOS, you need to "host" the jinstall FTP binary image on an FTP server (possibly the VMWare host machine), and pull the file to the FreeBSD virtual machine. I initally wanted to install JUNOS 5.7 "jinstall-5.7R2.4-domestic-signed.tgz", and then later get a more recent JUNOS 8 image on to the virtual machine, so it would detect and use the network cards. You cannot initially install a version greater than 7.4 as it will return an 'ELF binary type "0" not known' error. At this point, you should have a running FreeBSD virtual machine, which can receive files by FTP from an FTP server that you are hosting a "jinstall" JUNOS image on (which is lower than version 7.4). When the virtual machine reboots, you may lose access to the CLI dependant on which version you loaded. With a version 5 image, you will still have access, with a higher version, you lose access. The following two sections discuss accessing the virtual machine through the serial port, and then the section following those discusses upgrading the JUNOS version to one higher than 7.4 so the "e1000" virtual NICs can be detected and utilised. My VMWare machine was aching to be configured by the serial port but I had no appropriate cable to do so - currently it was outputting everything to a text file coutersy of VMWare but I had no way of issuing any commands. 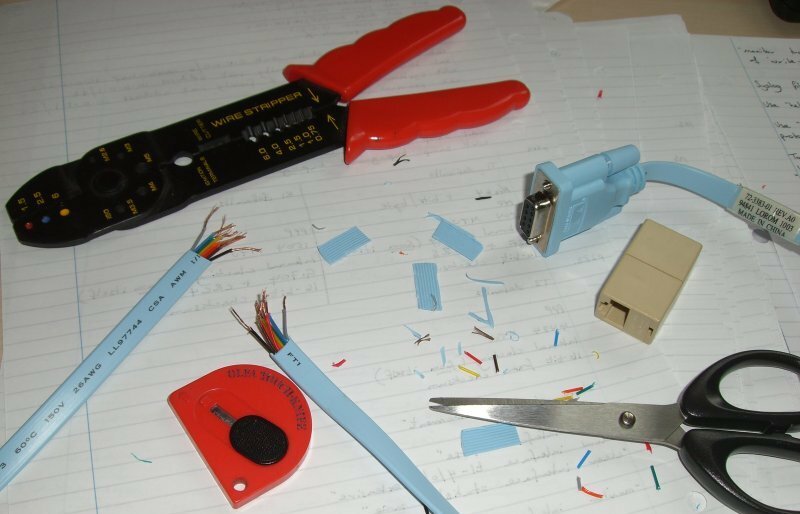 I had plenty of Cisco rollover console cables so I decided to chop one up, to fit my purpose (see below). I already have a Cisco 2511 console server with 16 asynchronous ports, and I wanted to use this to access my Olive. So my 2 asynch octal cables had RJ45 male connectors, and I did not have an RJ45 male to DB9 serial converter. This worked perfectly, first time, and allowed me access to the JUNOS/FreeBSD CLI. This worked well with Putty and Windows telnet, however SecureCRT had some issues - I had to configure "Force character at a time mode" in the session options, else the intuitive features built in to JUNOS did not work such as the use of "space" to auto-complete configuration commands. When you install JUNOS, it strips the file system to the bare bones, including any other images you may have downloaded (which is a pain!). I found if you built a second FreeBSD virtual machine (which has no intention of running JUNOS), and get it to the point of having IP connectivity, you can FTP an up to date image to the hard disk of that virtual machine, then steal that whole hard disk partition image by copying the hard disk .vmdk file to the JUNOS virtual machine directory, and add it as a second hard disk. Then when JUNOS boots, you can mount the second hard disk, and pull over the new file. Now copy the .vmdk file to your JUNOS machine directory, and add it as second hard disk in VMWare. If you have to rename the file so it is different, then that is fine. We will delete it as soon as we have the file from it that we need. To add the second hard disk: Click "edit virtual machine settings"; Click Add; Click Next; Click "use existing virtual disk" radio button; Browse to the .vmdk file; Click Finish. You should now have a second IDE hard disk called "IDE 0:1"
Now boot the JUNOS machine - you should see that both hard disks are found in the boot output of the serial port. Edit the virtual machine settings again and remove the second hard disk, and delete the second hard disk partition file if you so choose. Copyright (c) 1996-2007, Juniper Networks, Inc. Copyright (c) 1992-2004 The FreeBSD Project. Preloaded elf kernel "kernel" at 0xc0759000. em0: Memory Access and/or Bus Master bits were not set! em1: Memory Access and/or Bus Master bits were not set! em2: Memory Access and/or Bus Master bits were not set! psm0: failed to get data. if_pfe_ls_alloc_bdl_cb_list: Initializing bundle control block list. ata1-master: <VMware Virtual IDE CDROM Drive/00000001> CDROM device - NO DRIVER! Setting initial options: debugger_on_panic=NO debugger_on_break=NO. Initial rc.i386 initialization: microcode kld. displayName = "FreeBSD Olive COM2"
uuid.location = "56 4d 48 9f 5a 4f ca 2b-15 14 5c 14 d8 4d 8e 6a"
uuid.bios = "56 4d 48 9f 5a 4f ca 2b-15 14 5c 14 d8 4d 8e 6a"